Agilent Technologies Inc. (NYSE: A) has announced new optical switches that enable more cost-effective optical transceiver manufacturing tests and higher efficiency in optical component and cable verification. Optical switches are used in fiber-optic test systems to automatically route optical signals. They are also used to optimize manufacturers' investments in automated test equipment by improving repeatability and throughput and by supporting parallel measurements on multiport devices. Agilent's new N77 Series switches accomplish these tasks with excellent repeatability and flexible automation control. The Agilent N7731A dual 1x4 optical switch and the N7734A 1x13 optical switch are available for single-mode or multimode fiber-optic connections. "Manufacturers of optical transmitters and receivers constantly strive for better yield and lower cost of test," said Jurgen Beck, general manager of Agilent's digital photonic test products. "Our new optical switches help them achieve their goals by making accurate measurements and making automation easier with excellent repeatability, fast switching time and flexible control with LAN, USB and GPIB interfaces." In many cases, manufacturers can use valuable signal source and analysis instrumentation more effectively in a parallel-test configuration. They can, for example, test multiple cables or components together during temperature cycling. Inherently parallel components - like those used for optical interconnections for 40G or 100G Ethernet using 10-Gb/sec components - call for identical testing in multiple paths. These applications are well supported by the 1x13 switch configuration, and the 13th path often can be used as a permanent reference path. Automated testing with switches also improves tests by avoiding repeated reconnections during measurements. The excellent switching repeatability of the new N77 Series switches assures that the signal level is constant from cycle to cycle. Multimode fiber applications are especially challenging because signals are distributed over a range of mode groups that can have different loss and delay in a link. For dependable multimode transceiver testing, the instrumentation should not change this modal distribution. The Agilent multimode switches are designed with very short collimated paths between fibers, so signals propagate in practically the same distribution as through uninterrupted multimode fiber. Designed for high test throughput, lowest cost per channel and narrow footprint, all members of Agilent's N77 Series optical test instruments are built on a common platform and provide a common PC-based user interface. A complete set of control interfaces (including LAN, USB2.0 and GPIB) simplifies integration with manufacturing control systems. Code-compatible with Agilent's Lightwave Measurement System modules, the new generation of switches can serve as plug-in replacements in existing test solutions. "Just-enough-test" with low hardware overhead. SCPI command set, compatible with existing instrument categories for easy drop-in replacement. Plug-and-play drivers and a PC-based graphical user interface. Additional information about Agilent's new optical switches is available at www.agilent.com/find/jet. High-resolution images are available at http://www.agilent.com/find/jet_images. 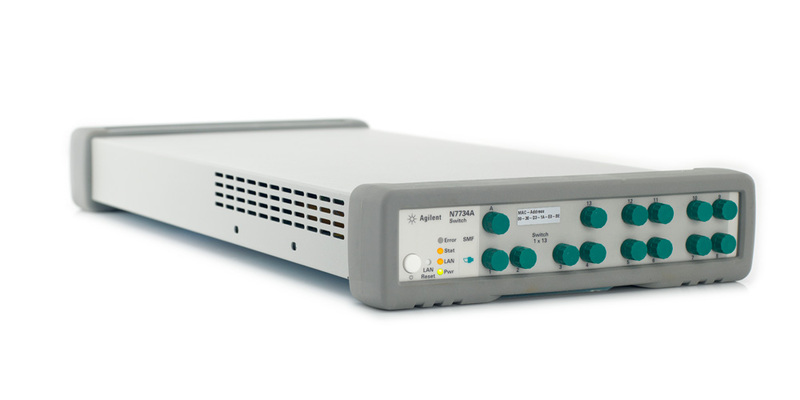 The Agilent N7731A dual 1x4 optical switch and N7734A single 1x13 optical switch for single-mode and multi-mode applications can be ordered now. List prices for the N7731A start at $14,500. List prices for the N7734A start at $19,000.